Scheduled for completion in mid-2022, the carrier will be built in Sturgeon Bay. A U.S.-flagged Great Lakes bulk carrier will be built domestically for the first time in more than 35 years as a result of a contract signed between The Interlake Steamship Company and Fincantieri Bay Shipbuilding. The 639-foot vessel will be constructed in Sturgeon Bay, Wis. Interlake, headquartered in Middleburg Heights, Ohio, is the largest privately held U.S.-flag fleet on the Great Lakes, with nine vessels carrying bulk cargoes and a rich history dating more than 100 years. 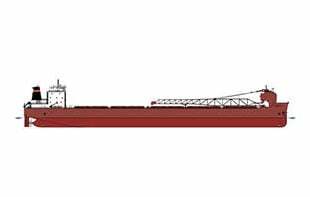 The Interlake Steamship Company, Fincantieri Bay Shipbuilding and Bay Engineering are jointly designing the bulk carrier, complete with advanced vessel and unloading systems automation. “We are excited to construct this historic large-scale bulk carrier on the Great Lakes for Great Lakes operation,” said Fincantieri Bay Shipbuilding’s Vice President and General Manager Todd Thayse. “We are very proud of our long-term relationship with Interlake, and we appreciate their continued confidence in our shipyard and in our shipbuilding team. This new project and our past work are indicative of the quality and attention to detail that our customers have come to expect from Fincantieri Bay Shipbuilding. It brings steady employment to the hundreds of women and men we employ from across the region, and the economic benefit to our suppliers and others is widespread,” he added. Scheduled for completion in mid-2022, the carrier will be built by 700 skilled trade workers. Major partners for the project include: American Bureau of Shipping (ABS); Bay Engineering (BEI); EMD Engines; Caterpillar; EMS- Tech, Inc.; Lufkin (a GE Company) and MacGregor. • A unique cargo hold arrangement and cargo hatch covers designed for maximum cubic space and the ability to handle difficult cargoes. • A flap rudder and bow and stern thrusters for high-level maneuverability. • The hull has been optimized for efficiency and all systems have been designed to ensure low energy consumption. • The vessel is designed for 7,800 shaft horsepower produced by two 16-cylinder EMD engines that are EPA Tier 4 and IMO Tier III certified and is expected to have a top speed in excess of 15 m.p.h. • The vessel will be propelled by a single-screw, 18-foot diameter Kongsberg controllable pitch propeller. • For its electrical power requirements, the vessel is provided with one 940 kW ship service diesel generator, two 2500 kW shaft generators and one 274 kW emergency generator.